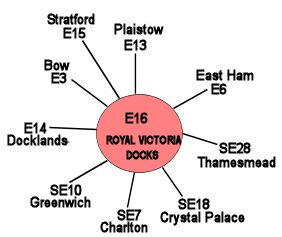 Nearest: DLR Station: London City Airport 0.2 miles (0.3 km), Railway Station: Woolwich Dockyard 1 miles (1.6 km), Tube Station: North Greenwich 1.8 miles (2.9 km), Motorway: M11 Junction 4 6.3 miles (10.1 km). You will find the Travelodge London City Airport enjoys a great location. Opposite the airport runway and just over half a mile from Excel exhibition centre. This part of London is to the far East, less than 3 miles from the Docklands and canary Wharf, some 5.8 miles from the City of London and 7.7 miles from the centre of tourist London. This redeveloped part of London links to the capital via the mono-rail system known as the DLR. However transport links by road are good and its an easy journey to most places by taxi or car. The train ride into central London takes around 35 minutes. The Olympic Park is less than 4 miles from this location to the North. Although the very immediate vicinity has little to offer the surrounding areas are far more lively with various amenities. The hotel is just on the North side of the River Thames while nearby on the south side are the Millennium Dome (1.9 miles), Royal Observatory Greenwich (2.7 miles), National Maritime Museum (2.7 miles) and Cutty Sark ship (2.8 miles).The 60 acre Gallions Reach shopping park, opened in 2003, is just 1.3 miles away on the North East corner of the airport. The nearest crossing point on the Thames is the Woolwich Ferry, which is a free service for pedestrians and vehicles and runs from early morning till evening. The alternative is the Blackwall Tunnel which is open 24 hours. A modern and cotemporary styled hotel, the Travelodge City Airport opened in December 2005. Onsite is a good sized fully licensed bar on the ground floor which is open until 1 am. There are 2 lifts giving access to all floors. Although the hotel does not offer left luggage facilities you can use the facilities at City Airport which are charged at a reasonable rate. This hotel has a Bar Cafe onsite serving all meals of the day along with alcoholic beverages. Breakfast is a buffet with full cooked breakfast an option. WiFi internet service can be picked up in this hotel. Due to security considerations it is not possible to store luggage at the hotel. Smoking is not permitted throughout hotel. Travelodge provide standard facilities across their UK chain in order that the customer knows what to expect at each hotel. Standard facilities include King-sized bed and duvet (in most hotel's), spare pillows in wardrobe, En-suite bathroom with shower, Remote-control colour TV, Tea and coffee-making facilities, Direct dial phone, Internet access and In room films. Onsite standard facilities include a 24 hour reception, breakfast served (charge) and a drink/snack vending machine. Lodges offer express check-in facilities and no need for check-out. Travelodge Excel: is 0.3 miles (0.5 km) away, has a guest satisfaction score of 80% and rates start from about £45. Travelodge Docklands: is 2.1 miles (3.4 km) from here, earns a customer rating of 70% and base rates begin at about £95. Travelodge Stratford Hotel: 3.1 miles (5.0 km), rated at 80% and with rates from around £49. Travelodge Aldgate East: 5.0 miles (8.0 km), rated at 60% and with rates from around £59. Another to Consider: A similar type of hotel (size, rating) nearby (0.4 miles, 0.7 km) would be the 3 star Connaught House Hotel ExCel, with rates that start from about £69 and which has an 86% guest satisfaction rating. The Connaught House Hotel ExCel also offers: free WiFi. We can also suggest a cheaper options nearby which would be the MOXY London Excel. 0.3 miles from the Travelodge City Airport (0.5 km), has scored 87% from former guests and has rates from around £50. The closest fifty hotels around this area (Hartmann Road, E16 postcode) that are listed on this website cover a 3.4 miles (5.5 km) radius. The numbers for each star rating are 3 five star hotels (average rating 91%), 18 four star hotels (average rating 84%), 19 three star hotels (average rating 78%), 8 two star hotels (average rating 75%) and 2 one star hotels (average rating 65%). Top 3 star hotels are Premier Inn Docklands Excel, Premier Inn Stratford and Premier Inn Greenwich (all three rated 89%). The highest rating in the isa goes to Intercontinental London O2 Arena (5 star) at 93%. Base Rates: We look at what the average base rates are for the area and by star rating. These rates do not take account of offers and short term deals so are just a guide. If we look at the average for all hotels in the area (nearest 50) we get an average base rate of £82 per night. The lowest rates are at £34 at Ibis Hotel Barking (2 Star, 76%) and highest base rates of £250 at Fox Apartments (4 Star, 90%). Averages for each sector of star rating: Five Star average: £151, Four Star average: £101, Three Star average: £69, Two Star average: £52 and One Star average: £45. We rank hotels based on our own proprietary algorithm based mainly on guest ratings but adjusted for influencing factors. We rank Travelodge City Airport 43rd (joint) of the 50 local hotels and 17th (joint) for the 19 three star hotels in the area. The hotel is 28th of 50 (12th of 19 three star hotels.) for lowest standard rates locally. Looking at the hotels rates plus its user rating we rank it 40th of 45 for sheer bang for buck (Ibis Hotel Barking was top). Directions: From the East: from the M25 motorway come off at junction 30 and follow the A13 and signs for central London. Keep on till you hit the roundabout at the junction of the A406 and the A1020. Take the left at this roundabout onto the A1020 and follow the signs for City airport. As you reach the airport the hotel is the large silver building opposite. From the North follow the M11 and or A406 Southbound and carry on as above. From the West and Heathrow: Follow the M4/A4 into central London. At Hyde Park Corner (which is the large roundabout at the end of Hyde park on your left) take the 3rd exit onto the A302 Grosvenor Place. Follow this road past Victoria station on your right until you hit parliament Square and the houses of Parliament. Take the third exit and then first left onto the A3211 Victoria Embankment. This is the turn left just before Westminster Bridge. Keep going straight until you have Tower bridge on your right. Keep going straight onto the A1023. Keep on straight and through the Limehouse link tunnel and at the end of the tunnel you will pickup the signs for City Airport. carry on as above.